“The Artist’s Guide to Archetypes” is an interactive seminar for authors/writers, playwrights, screenwriters, directors, actors and other performers to understand universal archetypes. Learning the symbolic language of archetypes will ignite your creative journey. This 2-day interactive seminar will facilitate your creation of captivating and character-driven plays, films, productions and performances. In this intimate and interpretative seminar, you will sharpen your ability to construct and portray convincing characters and deliver believable, enthralling storylines. Attend on Saturday or Sunday or both days. It is the nature of your work to be seen. How do you make yourself conscious of what you communicate and what the audience sees? How do you teach your audience how to see? How does an archetype differ from a stereotype? Identify the “mythic through-line” of your work. Accessing the Entrepreneur archetype—managing your vision of yourself and your vision of your work. Do you take on the archetypes of the character or do you adapt the character to suit your archetypal patterns? Or both? Each is a legitimate approach to the character. Every actor plays Hamlet differently. Every actress plays Blanche du Bois differently. The creation of a performance is a collaborative effort between the author, performer and director. How can an understanding of archetype and myth facilitate creative communication between the collaborators? How can an understanding of archetypes contribute to the physicality of a performance? Movement? Costuming? There may be participatory exercises in the Saturday morning session. There definitely will be in the Sunday evening session. There will be questions and discussions at both. Dates: Saturday, April 29 from 9:00 am to 1:00 pm and Sunday, April 30 from 6:00 pm to 9:30 pm. Attend on Saturday or Sunday or both days. You can also register at the door on the day of the seminar. 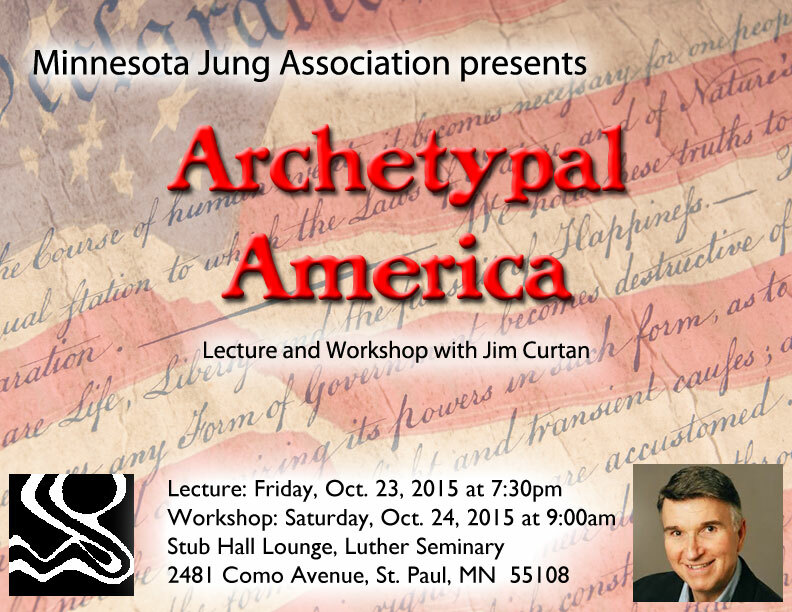 Available NOW: Archetypal America A live lecture recording from the Minnesota Jung Association workshop held in October 2015. Detail: Throughout American history the archetypes which populate our myths and legends and capture our imagination are the Rebel, the Revolutionary, the Liberator, the Scout, the Pioneer, the Cowboy, the Explorer, even the Outlaw: all of them perpetually moving forward in pursuit of their idea of freedom, both on behalf of the common good and at the expense of it. While many of these archetypes appear from the very beginnings of our history, the conflict between the various notions of freedom—personal and collective—solidified in the American psyche in the years leading up to and following the Civil War. They continue to impact us and our ideas of ourselves to this day. The Friday night lecture will introduce these archetypes, light and shadow, and the distinctions between each of them. The Saturday Workshop will use lecture, film clips, group discussion and exercises to explore these archetypes in depth as they impact us personally and as a society. Embracing the Grace of Change – Now available for purchase! The third edition of Archetypes & a Movie examines what happens when our old story has reached the end of it’s shelf life and how we can embrace the grace that change brings us. Using the film The Best Exotic Marigold Hotel as contemplation on the choices and opportunities that lead us to an unexpected next chapter of our lives. More info & download Part 1 of the course for free. Spend a day exploring the film “The Best Exotic Marigold Hotel” and contemplate the spiritual guidance available in a careful viewing of the film. Check your currency exchange rate. I’ve been invited back to Solstice Healing Arts Center to teach a three day archetypal intensive. It will be my third time there and it’s one of my favorite places to teach. Lisa Campion and Rhys Thomas are wonderful hosts and teachers and they’ve created a beautiful center. Ratatouille: Fate, Destiny & The Hero’s Journey available to purchase and download. *The workshop does not include tickets to any performance of “The Book of Mormon”.